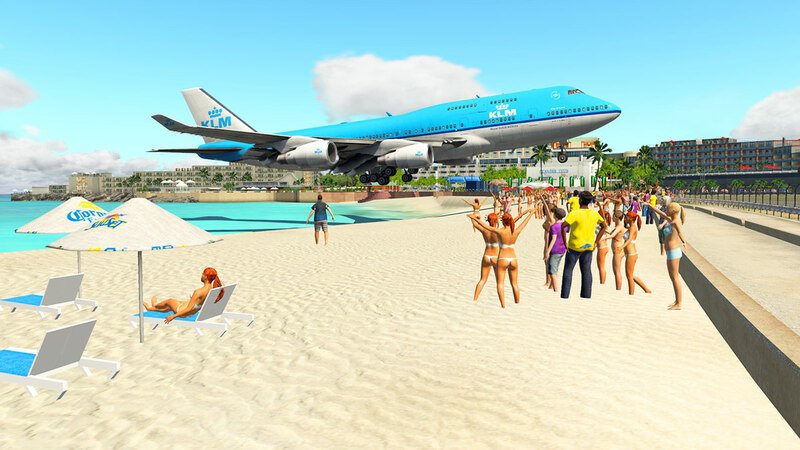 In either tourism or aviation it is one of the most famous images known... the image of a KLM Boeing 747 passing over Beacon Hill Road (Maho Beach) on finals and about to land at Princess Juliana International Airport (PJIA) in Sint Maarten. 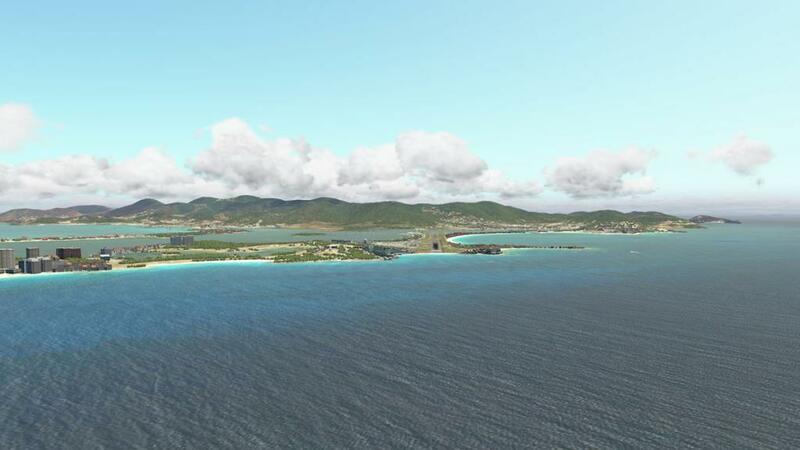 It is now history as well as KLM don't fly Boeing 747's to Sint Maarten any more since they started in 1990, as the final flight was held on 28 October 2016. 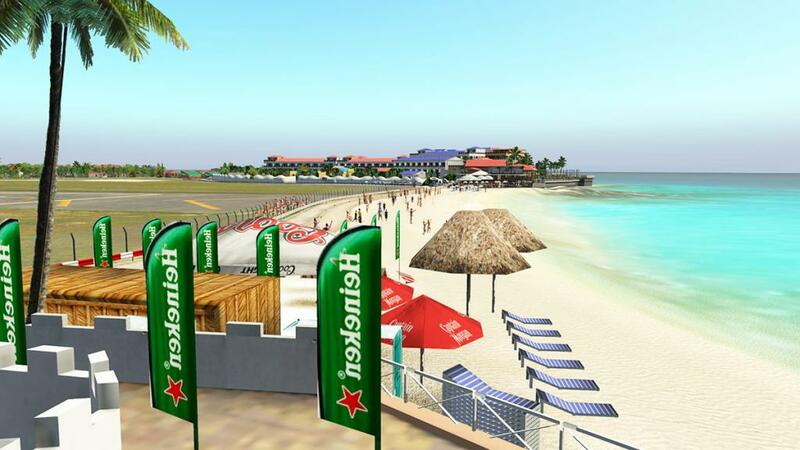 The aircraft would generally fly from Amsterdam, making a stop in Curacao before heading to St. Maarten. 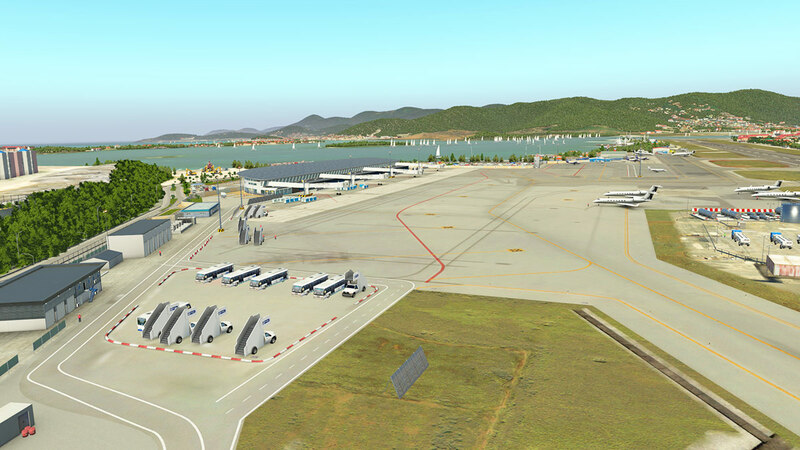 But however you can still fly on the route (but only direct AMS - SXM) and now on an Airbus A330 (FL KL789). 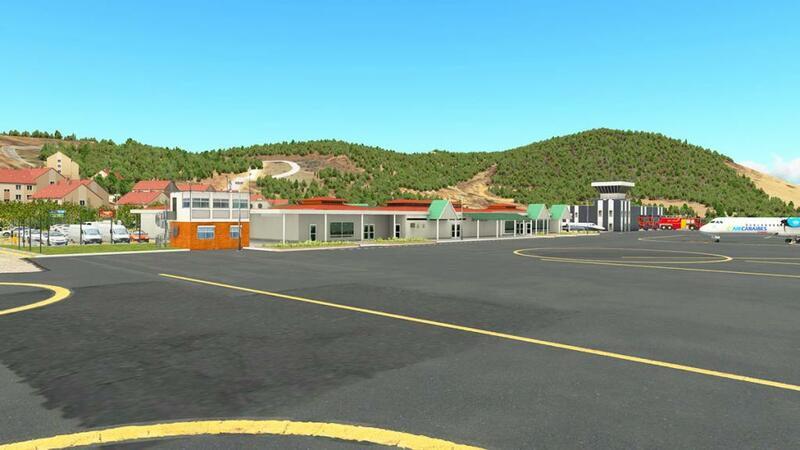 Besides trying to duplicate that image in X-Plane (it is far harder than it looks) Sint Maarten is a great base to explore the Anguilla area and islands, this is island hopping par excellence and X-Plane has had a variety of TNCM airports over the years but not one to do the area real justice, so here is Airworthy Design's version and it is a big if huge scenery of the area. 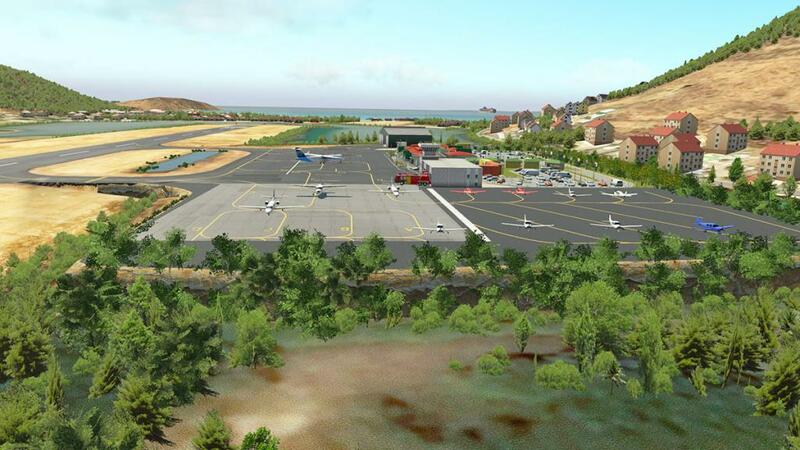 I will note is that "is this now the era of Mega Sceneries" for X-Plane, it feels like it, as scenery is now expanding, not only in cost but certainly in size. 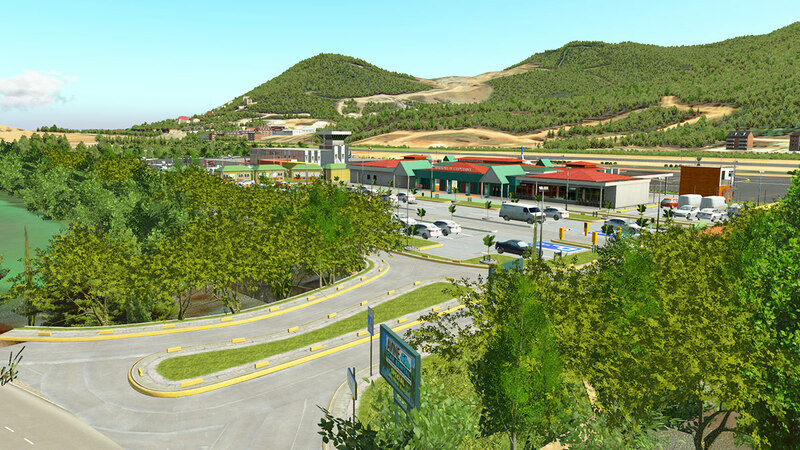 But the size aspect isn't in area, but in actual scenery size... in Gigabytes. 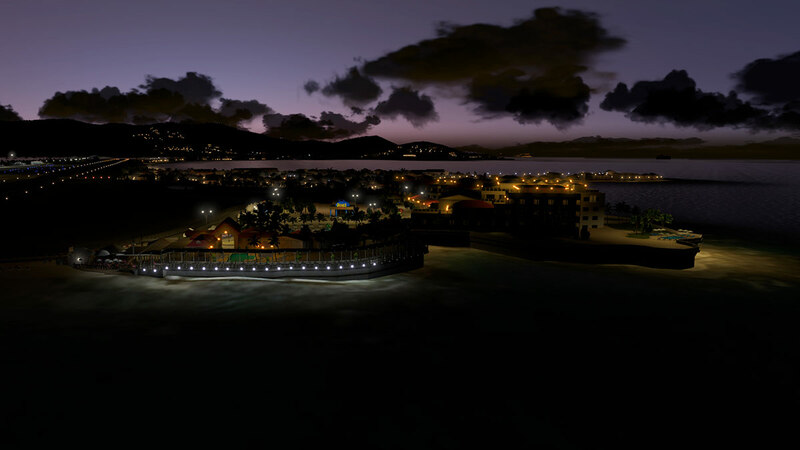 This scenery is a total of 14.71GB... yes that is 14.7 big ones! with a 6.5gb download. The recommended requirement is 4Gb VRAM Video Card Minimum and a 8Gb+ VRAM recommended in graphic cards but you will need at least 16gb of memory as well. An update reduced the download to 5.5GB, but the file size is the same. So the scenery is asking a lot of your specifics, and even I with my review Windows setup, the size just only crawls under that line. 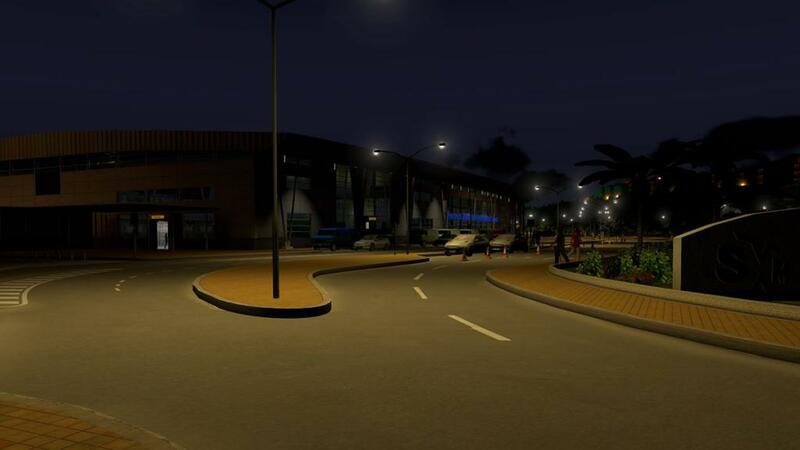 I will note my graphic settings here as they are important to the running of this scenery (as to all these newer mega sceneries) they are High (HDR), Maximum (Texture Quality), Highest Quality (AntiAliasing), High (Objects), Minimal (Reflection). 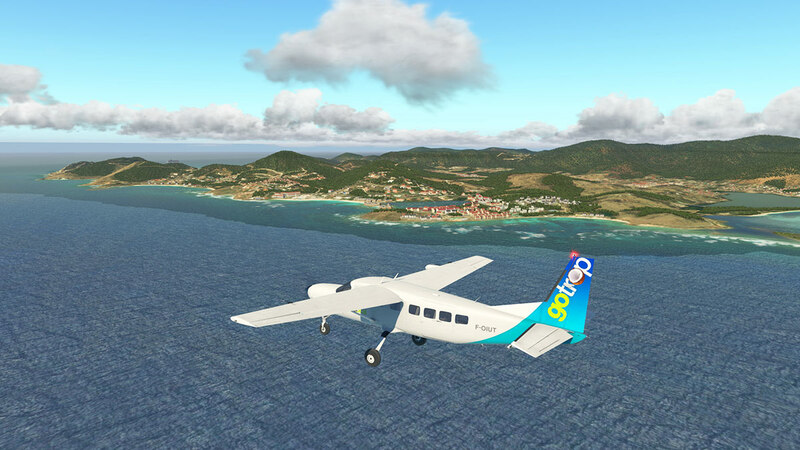 The scenery is also part 1 of two editions of the area, this scenery covers the main entrance to the area with Princess Juliana (TNCM) and Grand Case airports (TFFG) and photo scenery over the island of Anguilla. 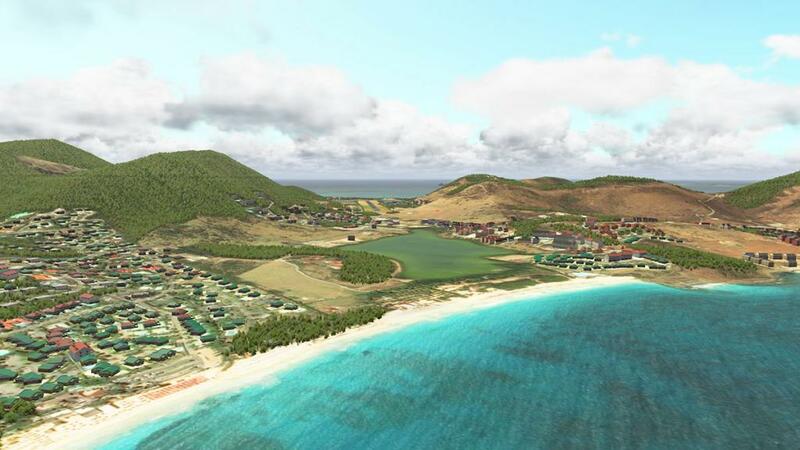 The second edition will cover St Barths (TFFJ) and Saba (TNCS). 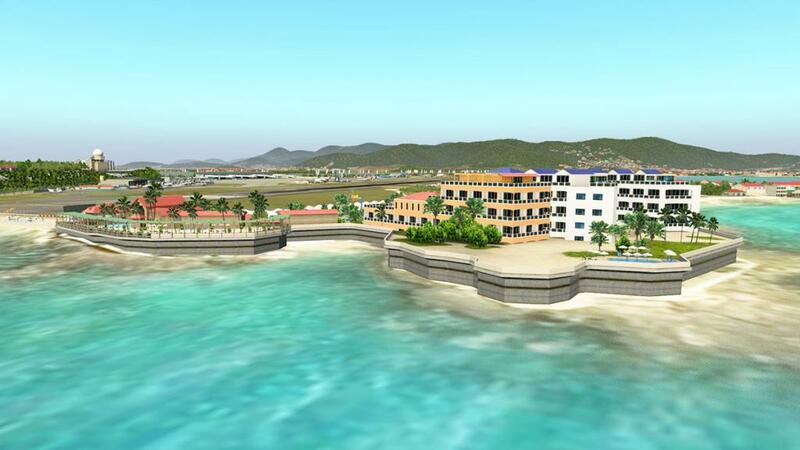 But the Clayton J. Lloyd International Airport on Anguilla will not be covered, which is an odd omission? 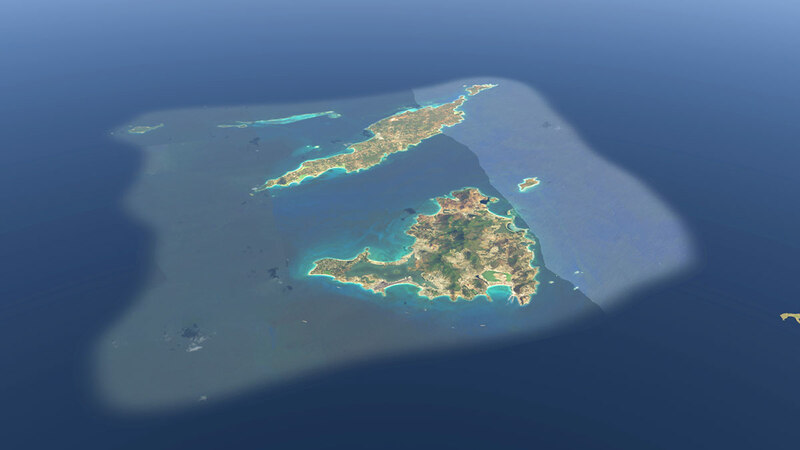 To clear up a slight confusion is the names of Sint Maarten and Saint Martin, the island is split between the Dutch (Sint) 40% and the French - Collectivité de Saint-Martin (Saint) of which is the Northern 60%.and the Princess Juliana airport is just south of the border in the Dutch zone and is Dutch in operation, for the French national interests it is the Aéroport de Grand Case or L'Espérance Airport (TFFG) that is positioned in the north of the island. 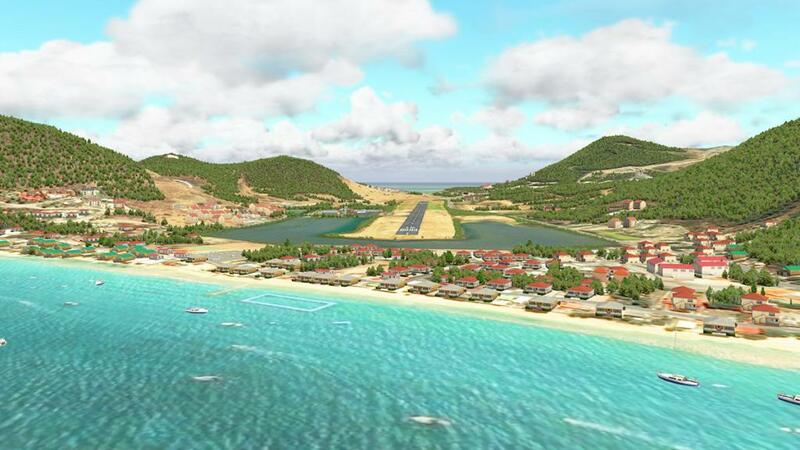 You get a good idea of the large area provided with the scenery by turning off all of X-Plane's weather features... and see the layout of Sint Maarten. ... and the trick of course is the water, or the colouring of the aspects of the water to note the islands tropical look and feel. The airport was started as a military airstrip in 1942. 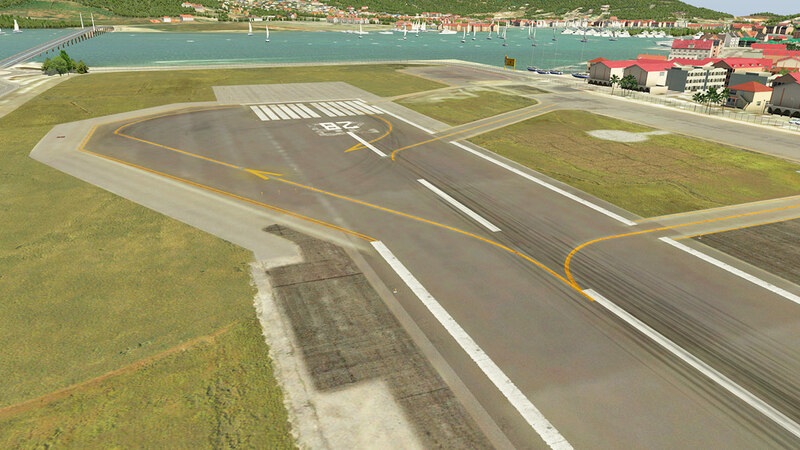 It was converted to a civilian airport in 1943. 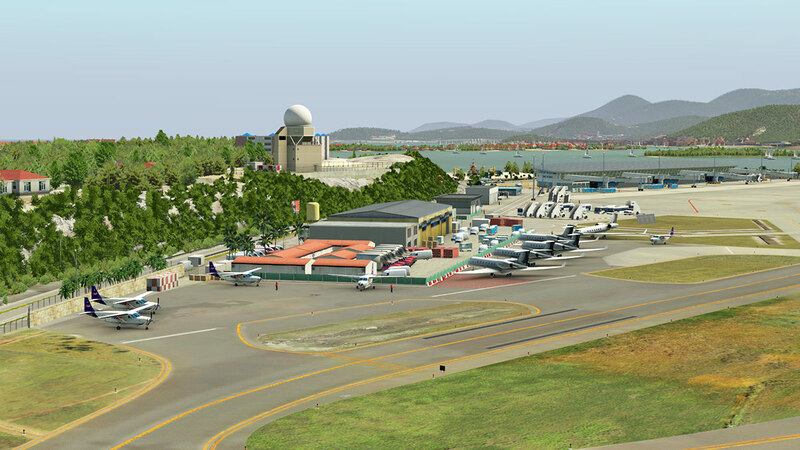 In 1964 the airport was remodeled and relocated, with a new terminal building and control tower. 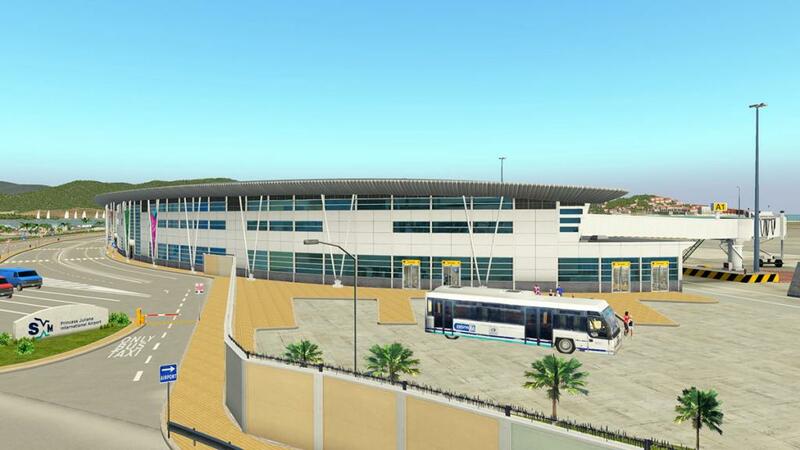 The facilities were upgraded in both 1985 and 2001 and the airport airport handles around 1,829,543 passengers and around 60,000 aircraft movements per year. 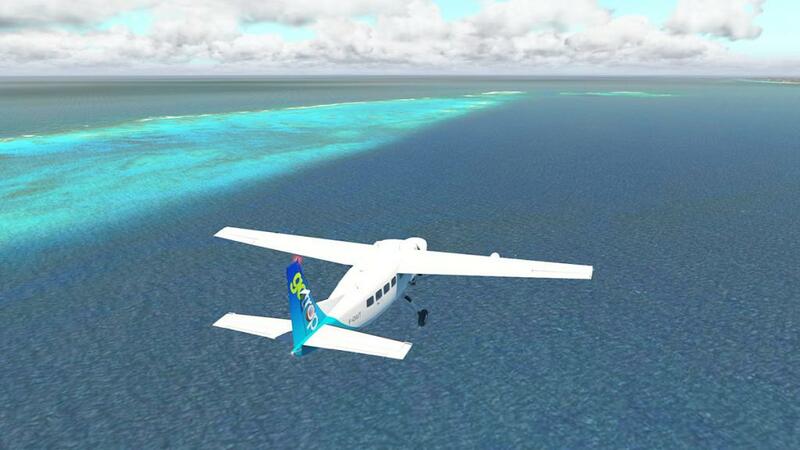 Noted is that TNCM is famous as the 4th most dangerous airport in the world because the approach to Runway 10 which is over water and pilots can become easily disoriented regarding their perceived altitude when operating under visual flight rules. Normal instrument checks, coupled with experience and situational awareness, mitigate potential problems. 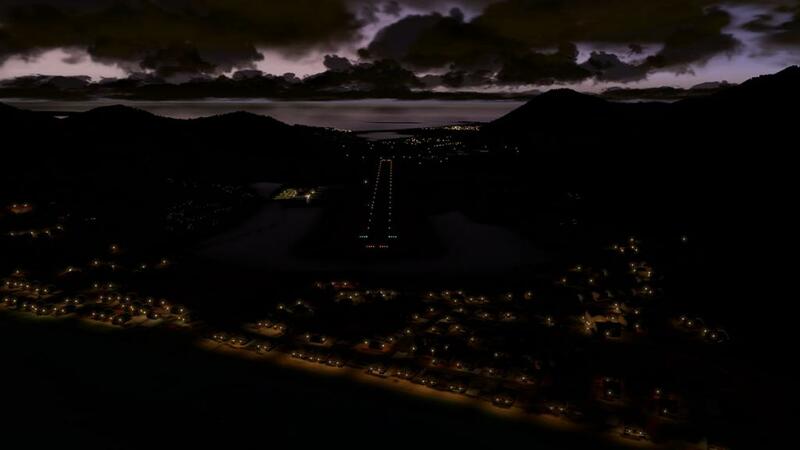 The departure from Runway 10 presents more "difficulties" than the approach, with a turn required to avoid mountains in the departure path. 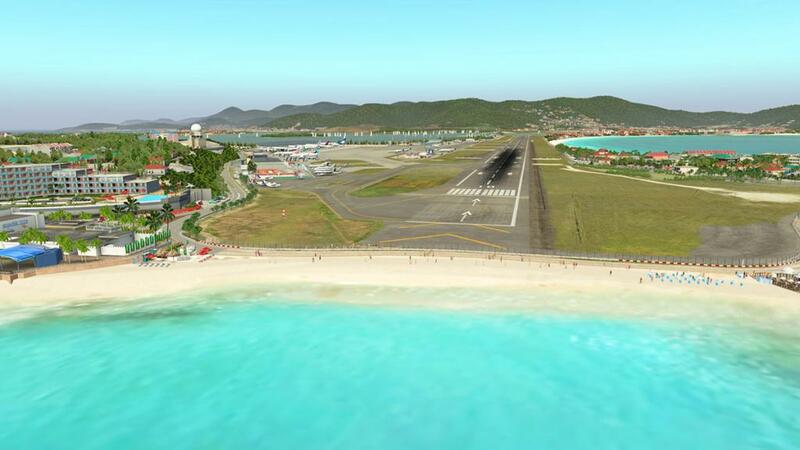 Arriving aircraft approach the island on the last section of the final approach for Runway 10, following a 3° glide slope flying low over the famous Maho Beach. 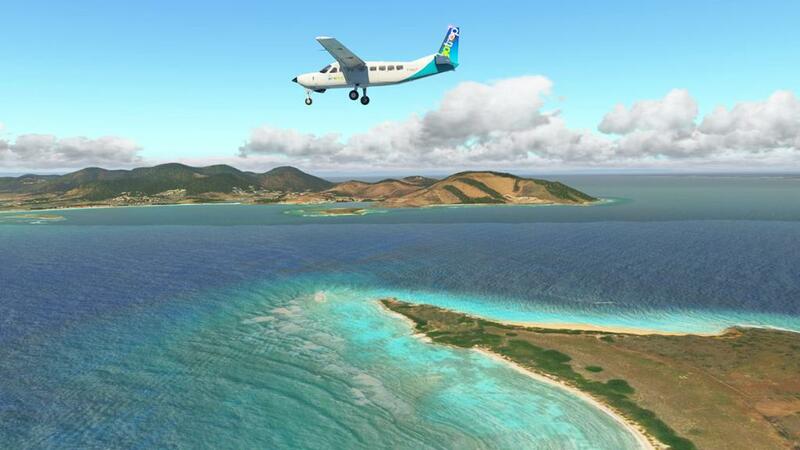 Pictures of low-flying aircraft were published in several news magazines worldwide in early 2000. 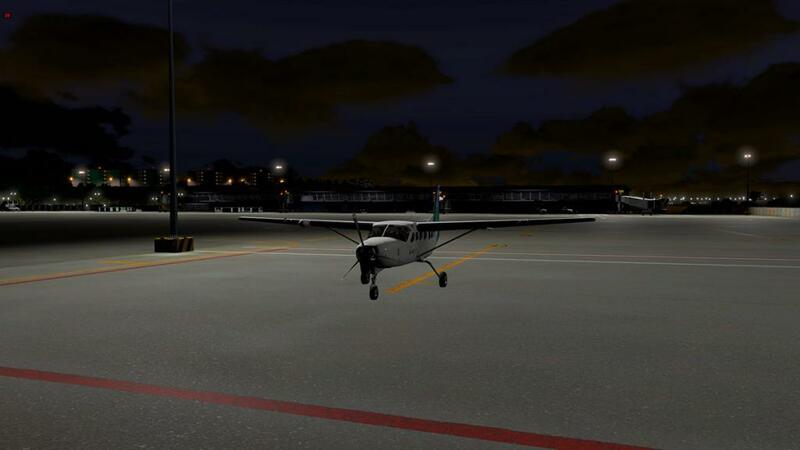 The thrilling approaches and ease of access for shooting spectacular images, made the airport one of the world's favorite places among planespotters and of course simulator users in wanting to recapture the challenging approaches and departures. 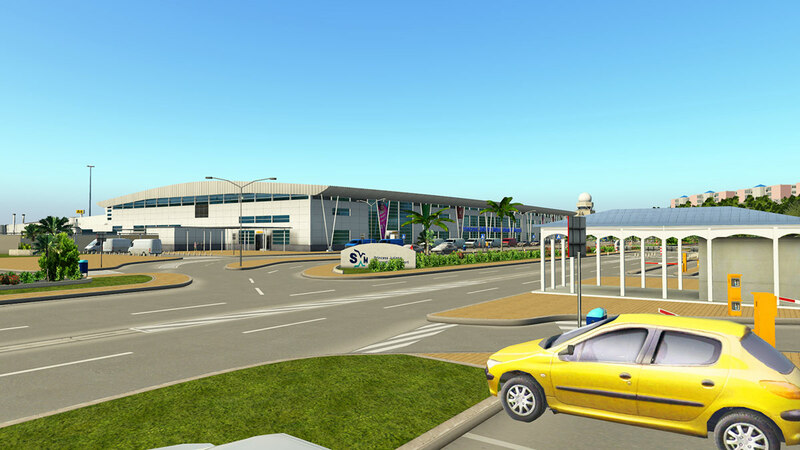 This scenery covers the latest upgrades to the airport (since damaged badly by Hurricane Irma on the 6 September 2017 which struck the island as a Category 5 hurricane). 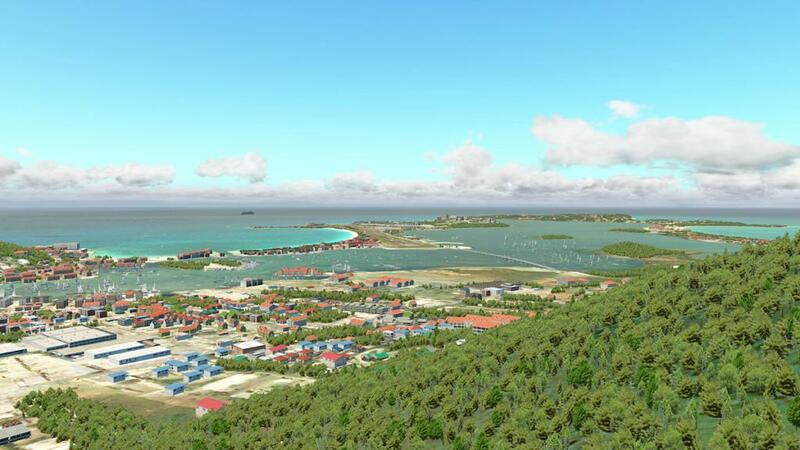 In reality TNCM can be set into two zones, the main area with the single large international terminal building (top) and the inter-island area for the mostly twin-engined island hoppers (below). Note the very large radar installation here at TNCM. 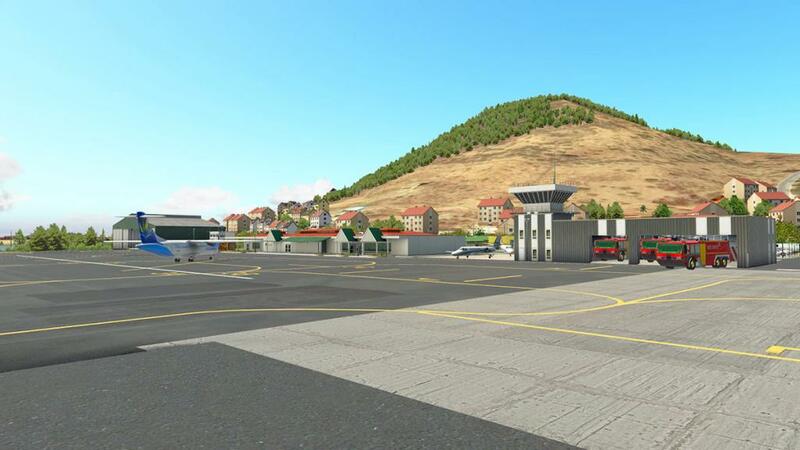 As since the official opening of the new control tower, PJIA air traffic controllers have two radar systems now at their disposal with ranges of 50 nautical miles (93 km) and 250 nautical miles (460 km). 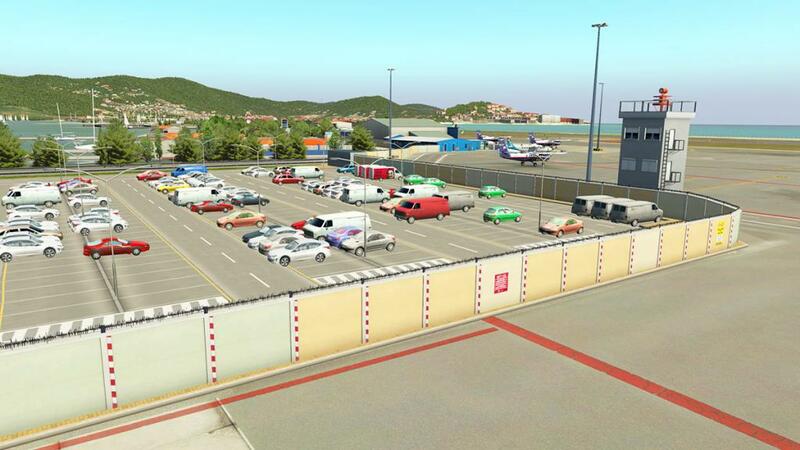 PJIA controllers manage 4,000 square NM of airspace known as the Juliana TCA around the airport, roughly between 25 nautical miles (46 km) and 42 nautical miles (78 km) of the St Maarten VOR-DME. 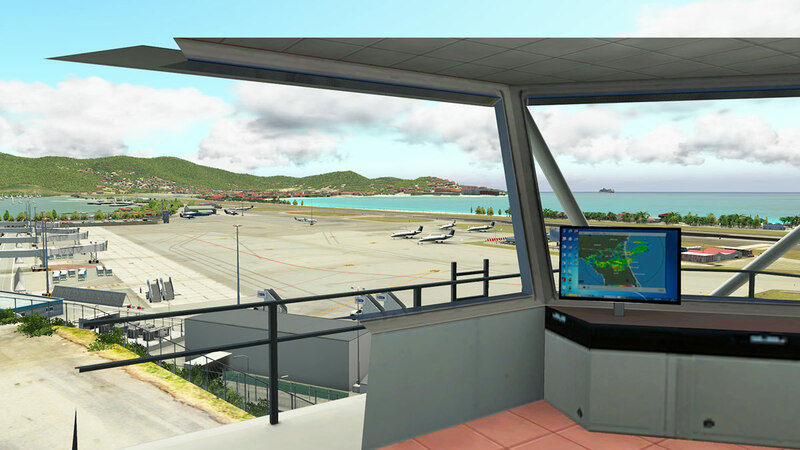 Besides providing approach, tower and ground control at PJIA, these controllers also provide airport approach control for Clayton J. Lloyd International Airport (Anguilla), L'Espérance Airport (French Saint Martin), Gustaf III Airport (St. Barths), F.D. 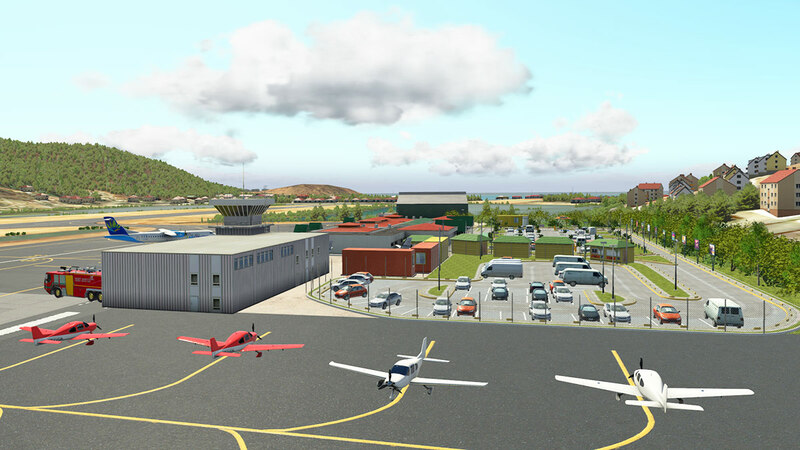 Roosevelt Airport (St. Eustatius) and Juancho E. Yrausquin Airport (Saba). 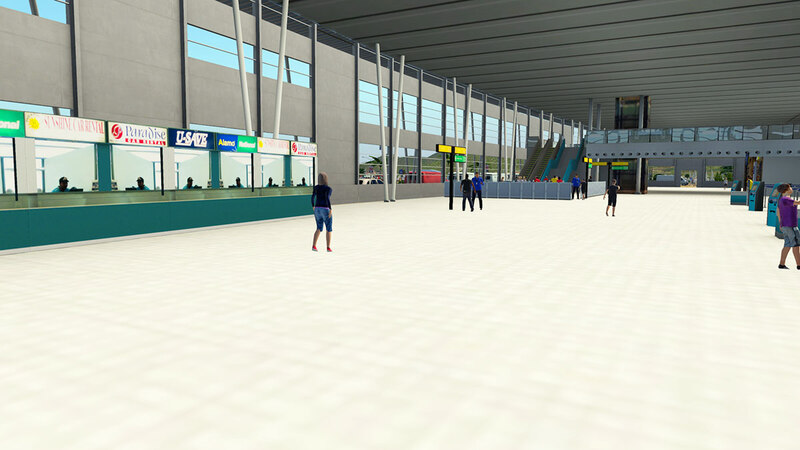 The terminal's design and textures are first-rate, with great graphic design to highlight the island destination. 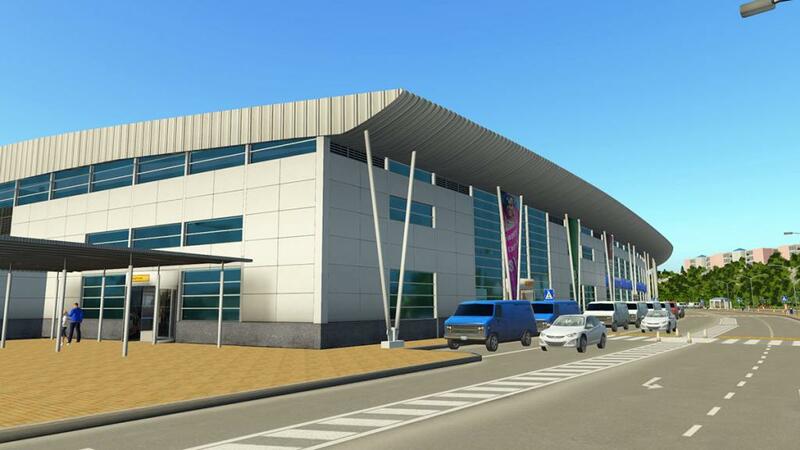 It is a big building and very striking in construction, The Terminal has four air-gates (A1 - A4), but they are not active DGS gates and excellent reflective (see-through) glass. 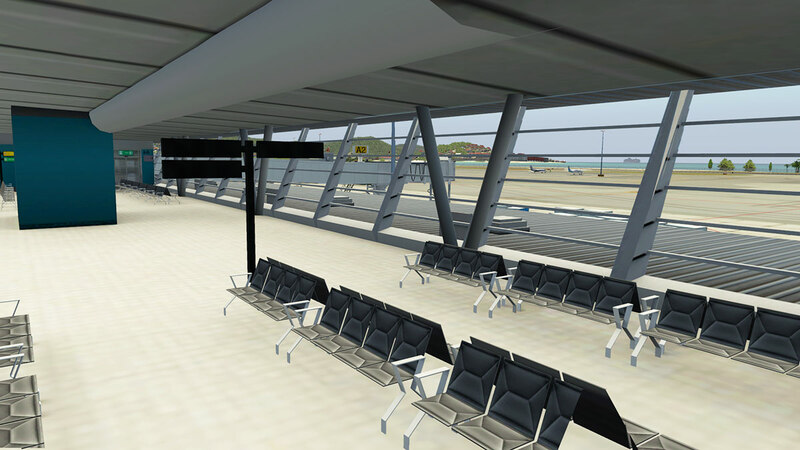 All the interior check-in and departure areas are modeled with not only the usual chairs and shops, but people as well, and you can actually see out of the windows of the parked aircraft. 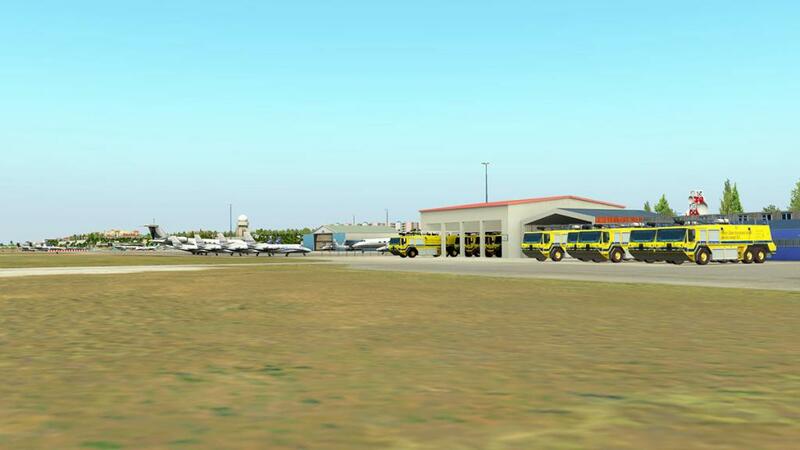 It is very extensive and in fact in a few areas a bit overcompensated with a bit of editing that could still convey the same thing, but with less clutter... like why are there private jet aircraft in the Cargo area and why some signs are reversed and how many Fire Trucks does an Airport need? 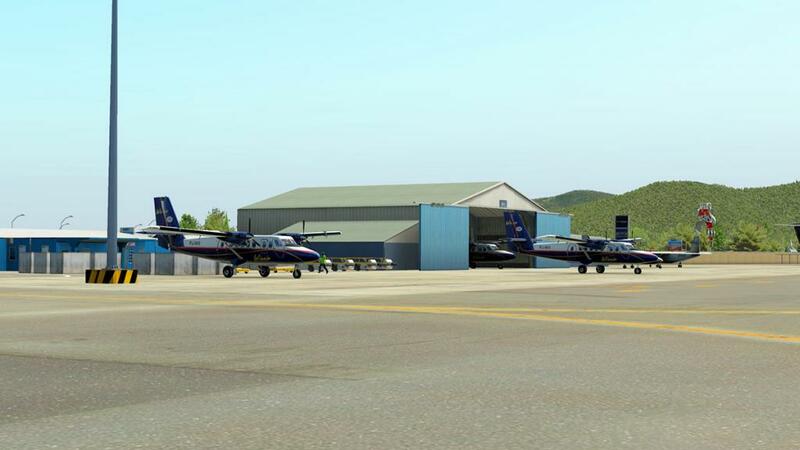 The Inter-Island area is very well done with hangars and aircraft, but again it is crowded and you will have to find a parking stand on the main apron, as this area is again full to capacity. Some users have noted floating objects around the terminal (mostly the airbridges) but in checking my installation it is fine. The tower view here is well... different. The idea is to give you view as the controller, but it doesn't work. 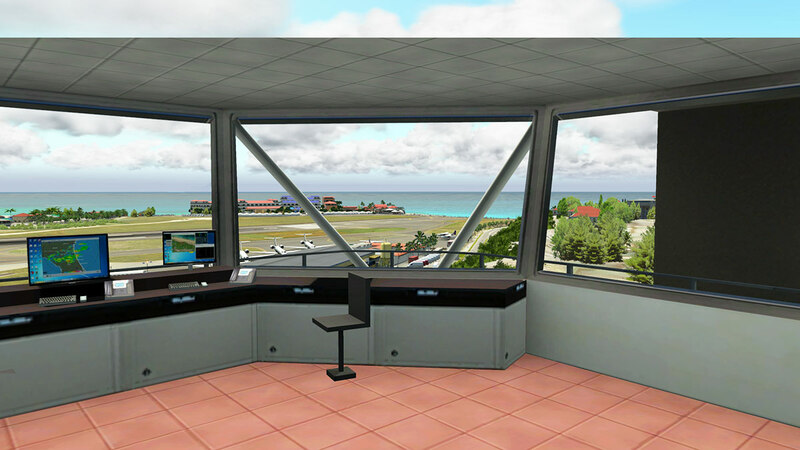 You are too far back from the actual point of view of where the control would actually stand and so the tower's broken framework intrudes into the view and the point of tower view is to give you a clear view of the approaches to the airport. ... 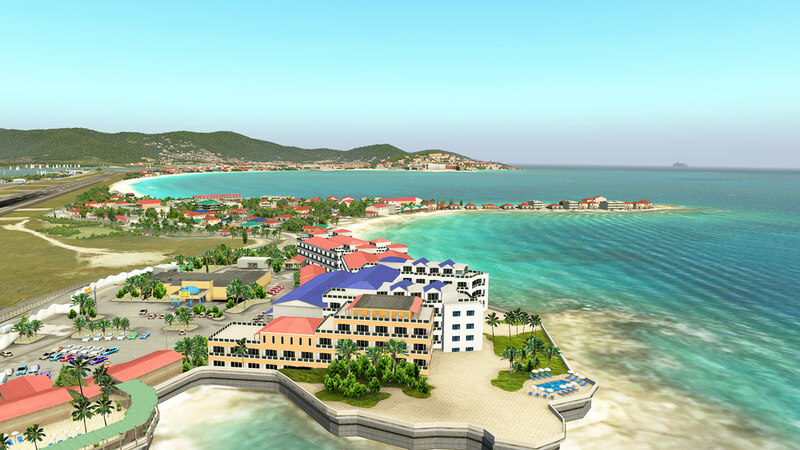 The extensive network of hotels on either side of Maho Beach are very well done from a realism of the area point of view. 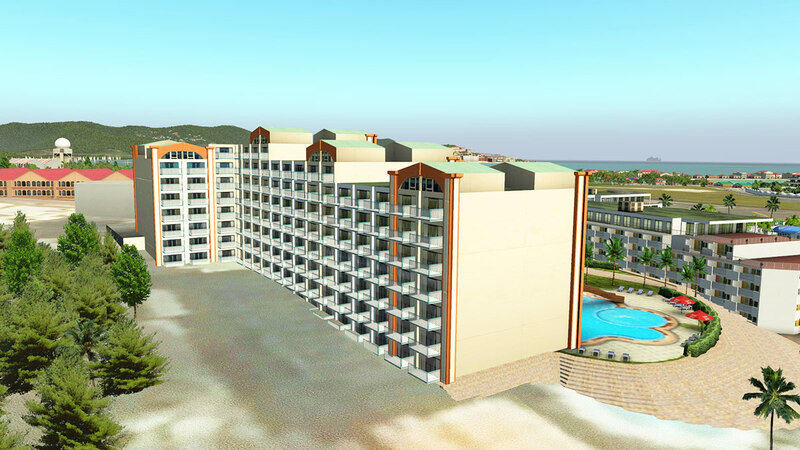 There is a huge amount of detail present, but also a few missing textures or unfinished areas like at the back of a few of the hotels. 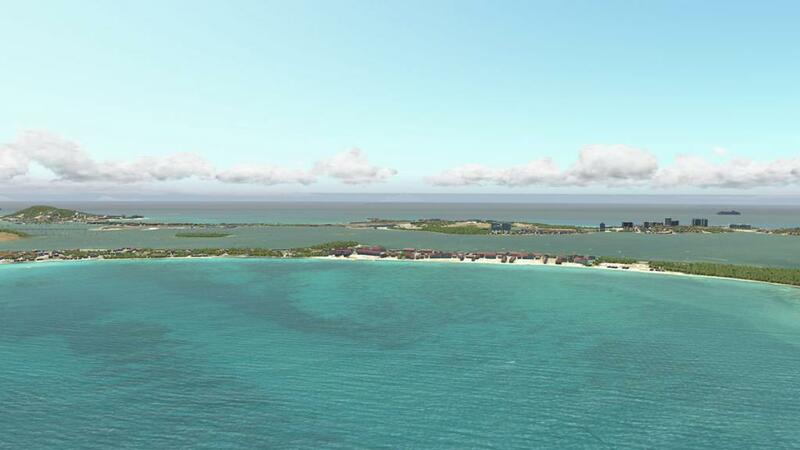 But you are certainly not lacking here for the island's tourism infrastructure and general facilities, and the vegetation is also very extensive. 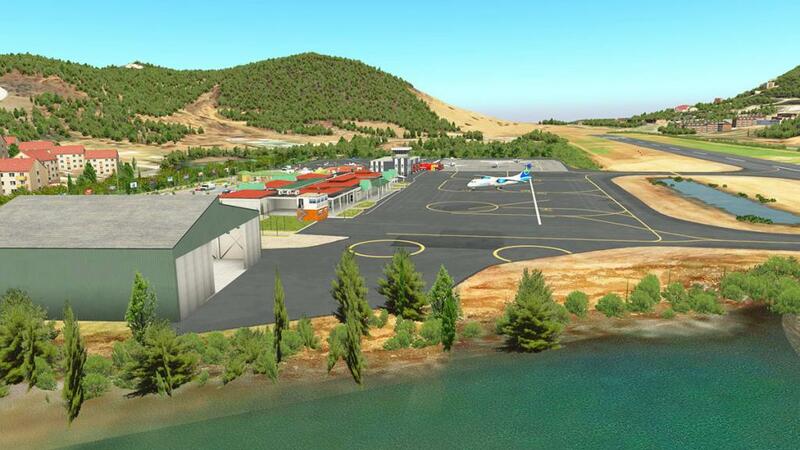 You are expecting another large airport facility for the French support of their territory, but Grand it is not, if not in that sense of the word. 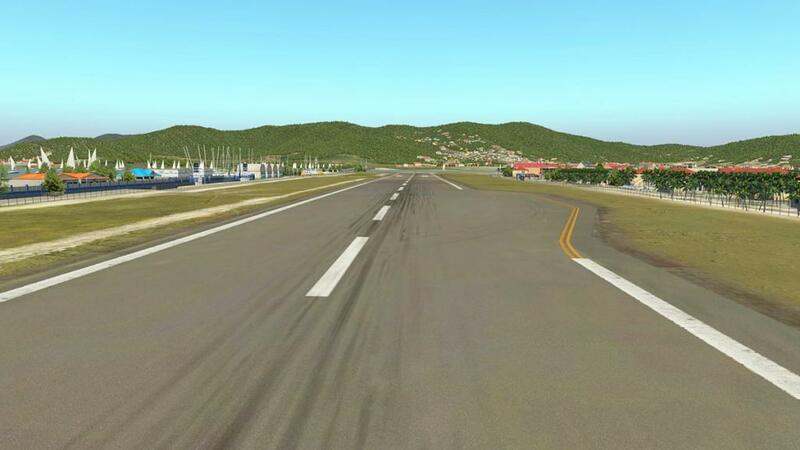 The single 12/30 runway is situated in a valley but is opened ended at both approaches for a exciting arrival, but the runway is short and even ATR turbo-props have to reverse up to get the run required to takeoff. 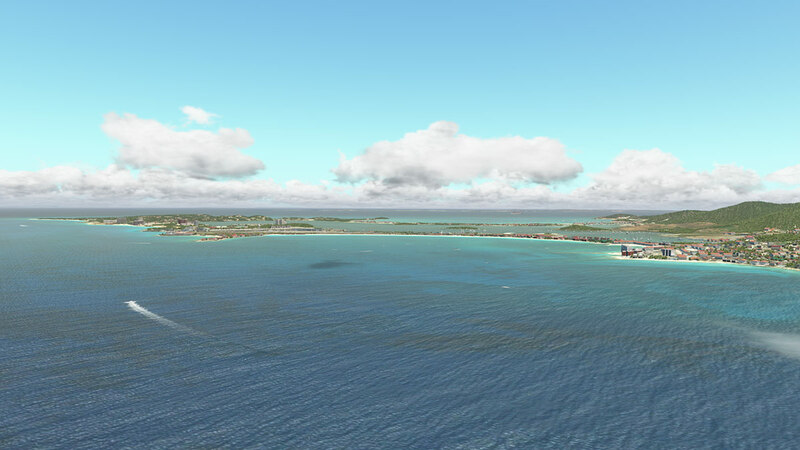 Incoming aircraft usually approach TFFG on short final for runway 12 over the bay of Grand-Case, with a corresponding view. 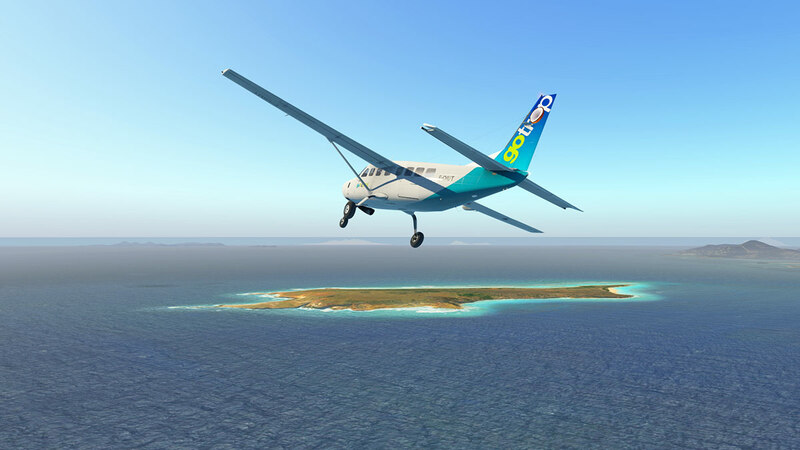 When wind direction changes, which is common, incoming aircraft then change the approach to the island on short final for runway 30, in the opposite direction. 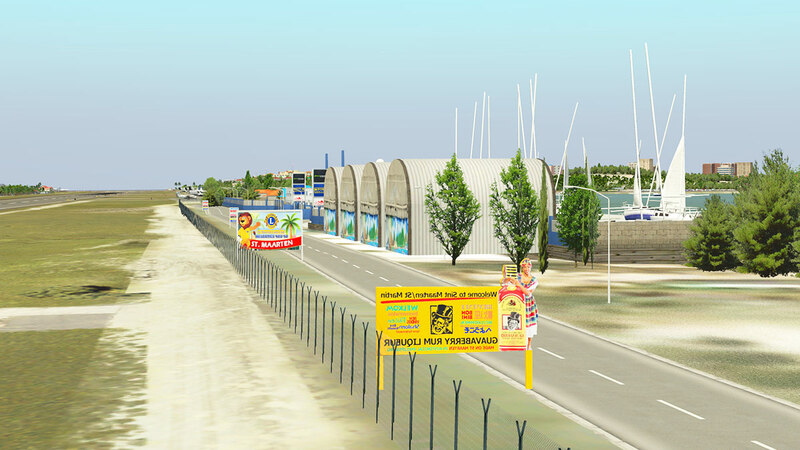 TNCM is actually not that far away to the south, you just take the coastal long way around to the French airport. 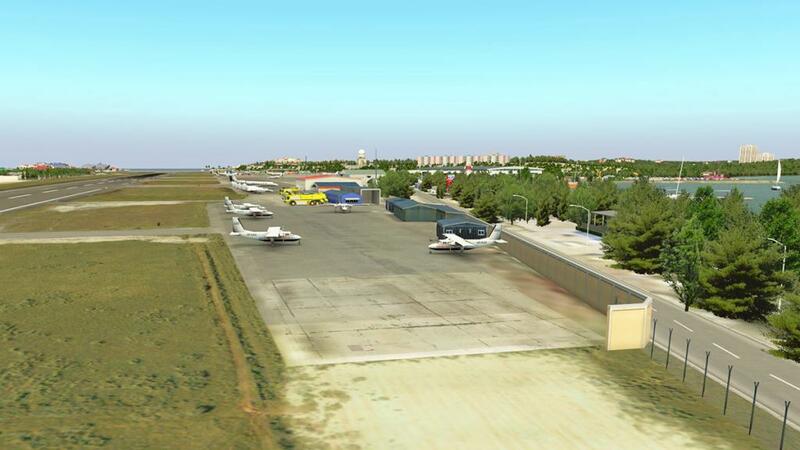 There is a nice if small ramp area and a larger GA area to the east . 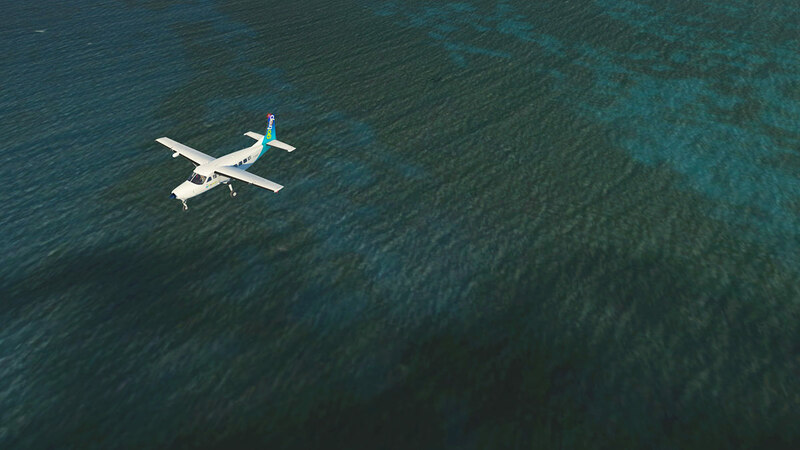 The airport is known for quick transfers from the larger turbo-props to the smaller GA aircraft for inter-island transfers, hence the layout. Small terminal is well done with a combined field control tower and Fire Station with the usual three fire engines per runway criteria. 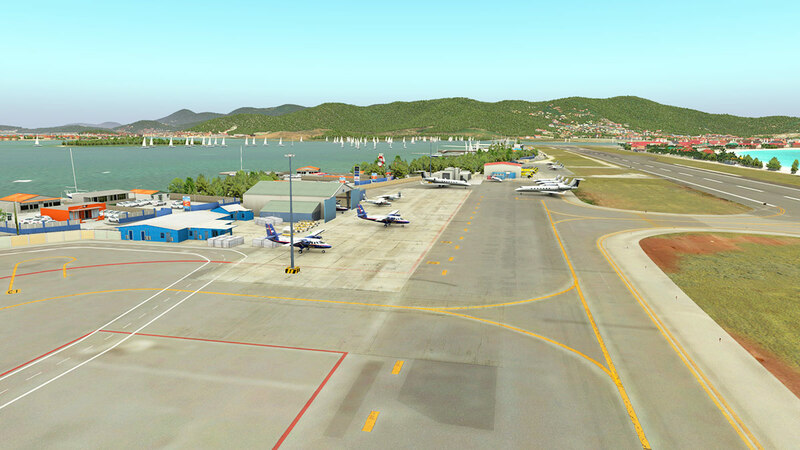 Detailing as as usual very good, with a lot of static aircraft (not much parking space though) and vehicles and excellent island/airport signage. 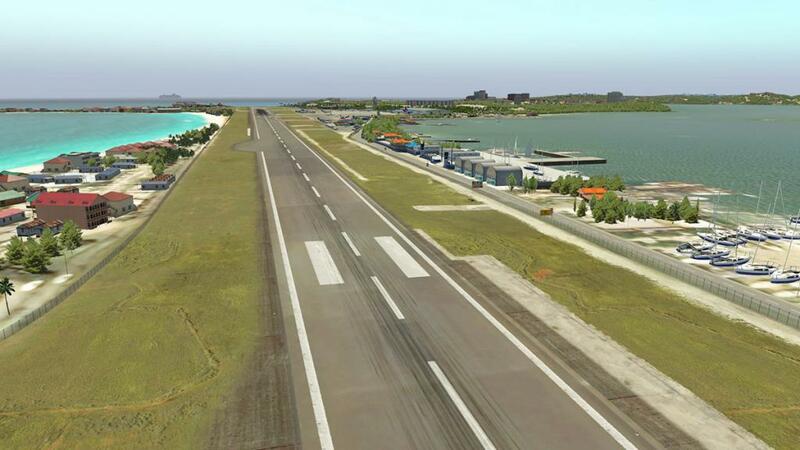 The biggest issue here though is the runway is unusable? 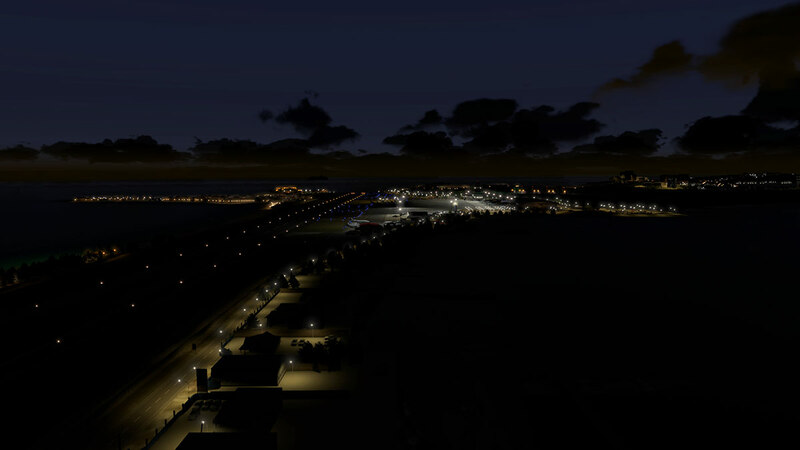 The actual runway surface (textures are like TNCM in being very good) but the surface has been set as a X-Plane "grass runway" setting and not tarmac. 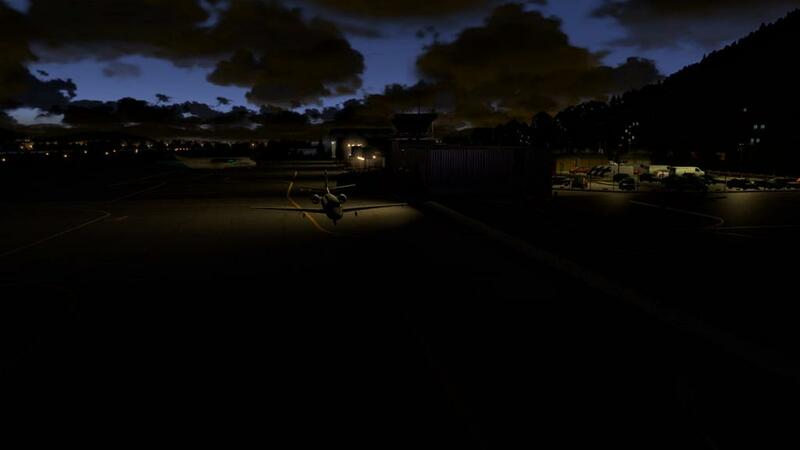 So when you land the aircraft it gets bogged suddenly down and it is very difficult to taxi or turn around until you get back on to the ramps harder areas? 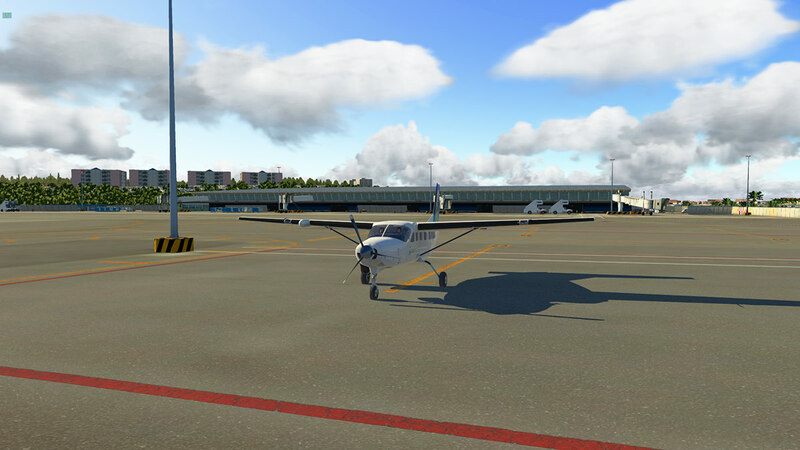 Takeoff is full power and hold on.. not doubt the issue will be fixed in an update, but currently it ruins the use of a great scenery. 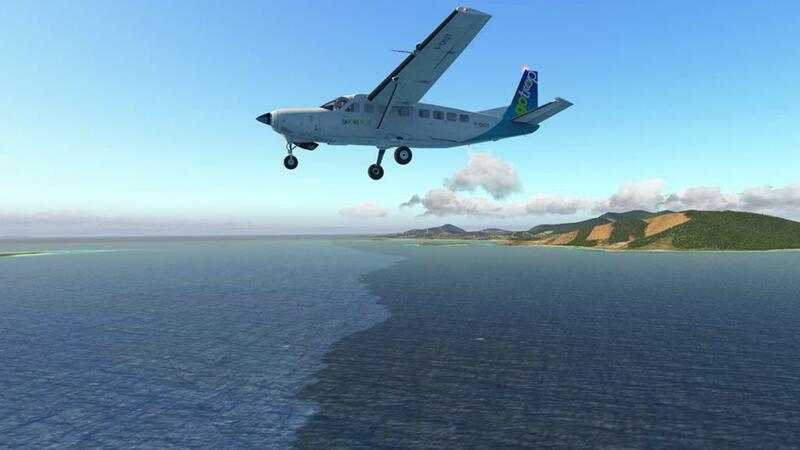 The one area that Flight Simulator did very well in was the presentation of shallow waters, mostly in tropical and coral regions of the world. 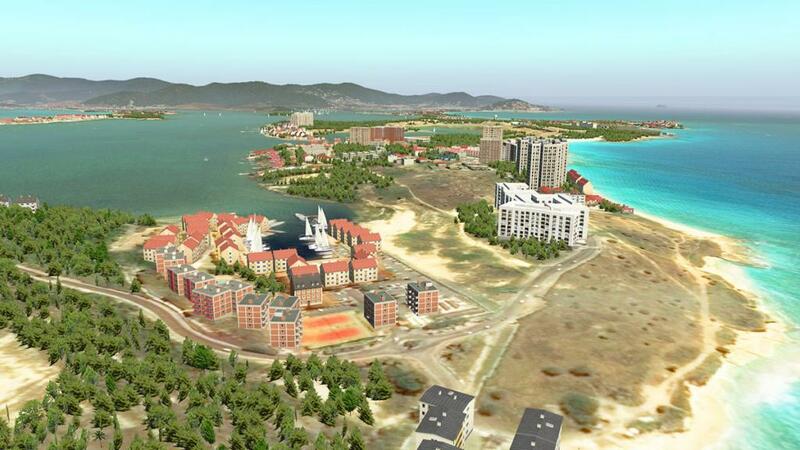 X-Plane has sort of done the same thing, but it's water system was not very good at depicting or recreating such environments, so mostly it was a confined area with big differences between the two areas with a) the shallow water in place, and b ) the hard edge where they joined up. 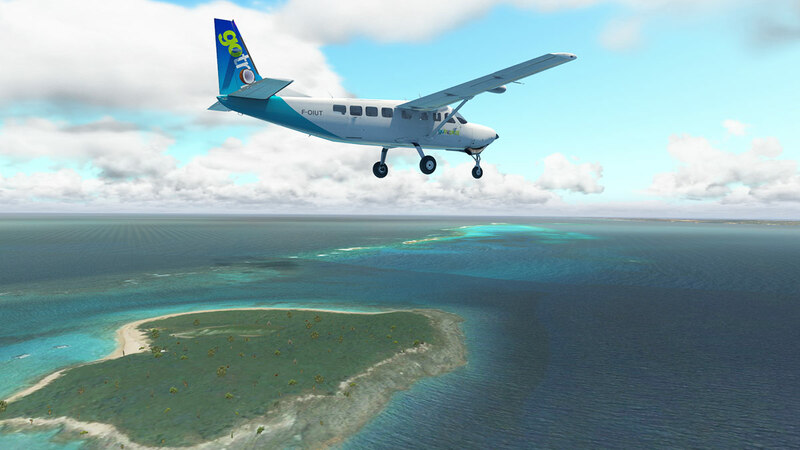 But the depiction here of such shallow water and coral scenery is one of the best and even the highlight of the scenery. 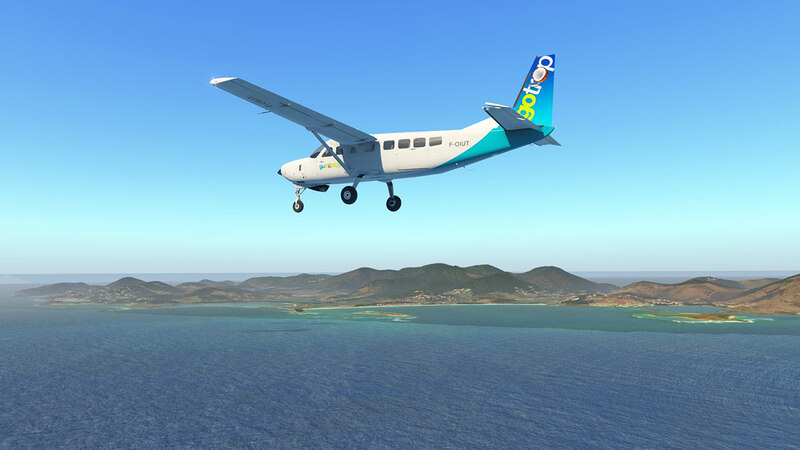 So I took the Carenado Caravan for a spin around the island to have a look. It is really spectacular flying, and in the right atmospheric lighting conditions also very realistic. 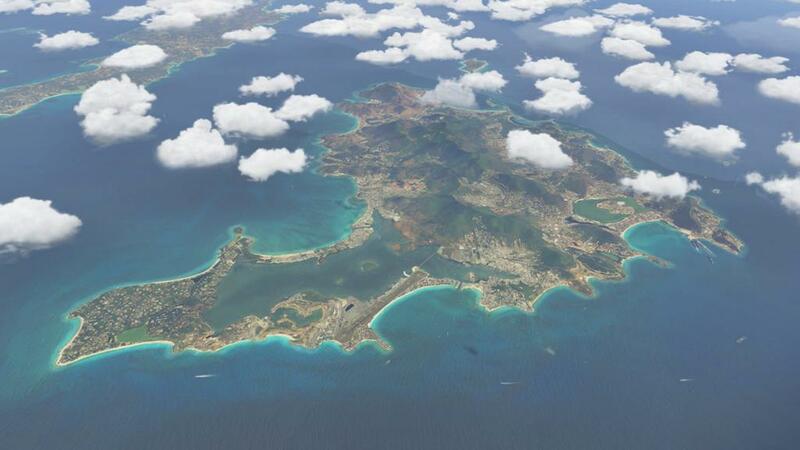 The area is very large as well which includes both the St. Maarten Island and the full area of Anguilla, south to Saba and far, far more. 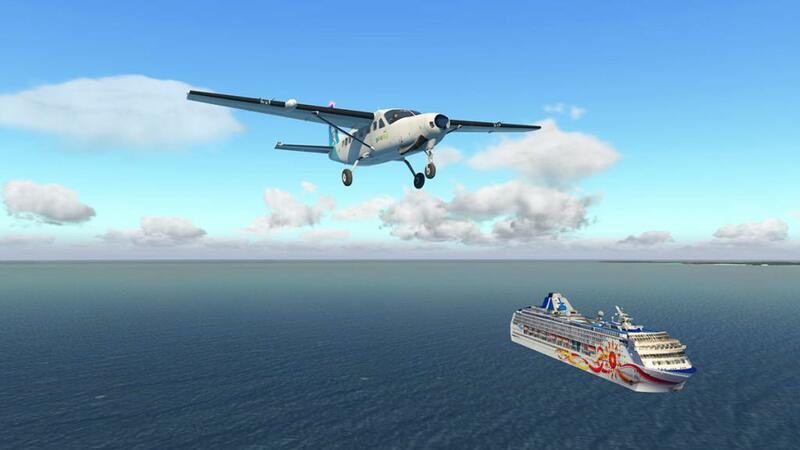 There are highly-decorated cruise ships (they can also be used as a pointer to an airport runway!) 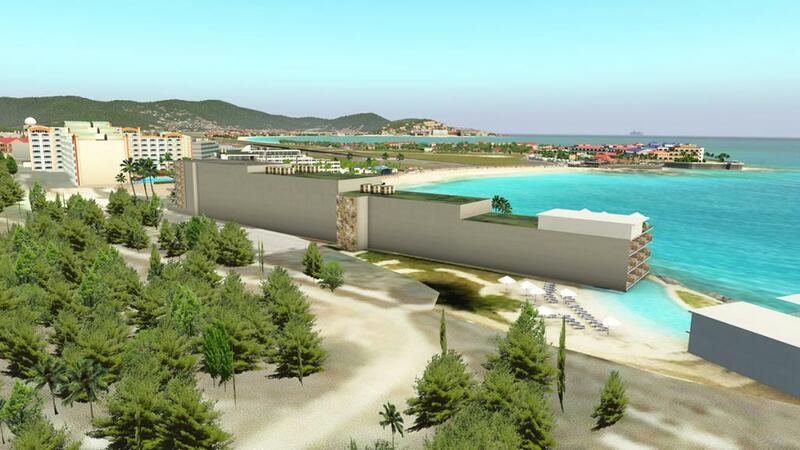 but four of the same ship in one cove is a bit unrealistic? 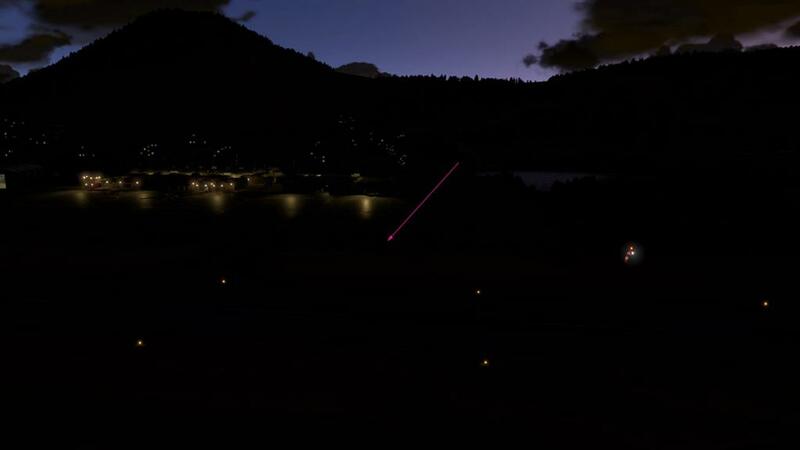 Another note that a few wakes on boats that don't exist are quite noticeable, sometimes this effect can work or work against the scenery? 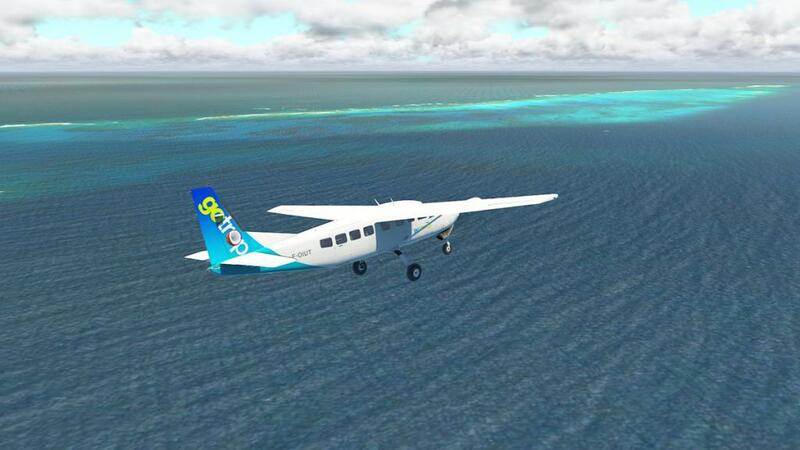 ... if you are willing to explore the outer coral banks then the rewards are simply outstanding. If you venture too far you do also come across the hard line of the sceneries boundary? 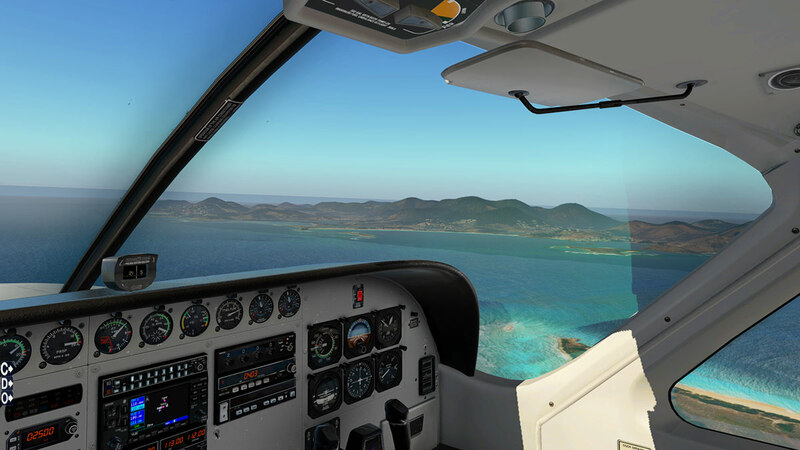 And so more gradual transition would have made the impact more real.... but overall this is X-Plane flying par excellence! 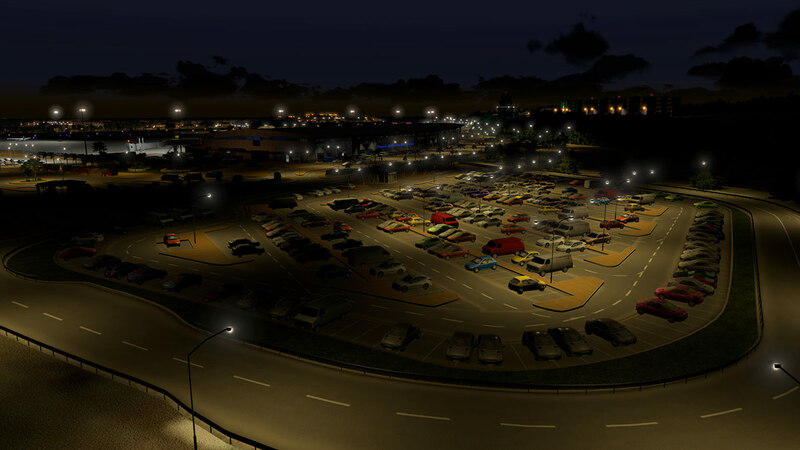 This is an extensive scenery, so the lighting does have a fair area to cover. And overall here the lighting is very, very good, but that comes with a penalty. This scenery is quite possibly the largest scenery I have ever loaded into X-Plane, and it has some strange effects on to my Graphic Card's functionality (8GB). 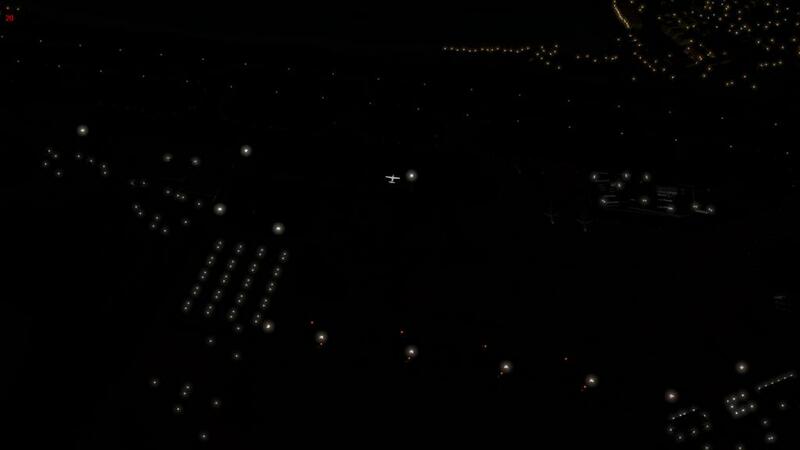 One is I get black areas and the shadow effects can sometimes go black, black instead of shaded greys, and it has a very weird effect on my WT3 aircraft view as well. ... but the same viewpoint (abover right) in the night environment it is crushed down to 20 frames and mostly stays in the 16fr-18fr zone? Why is that so? 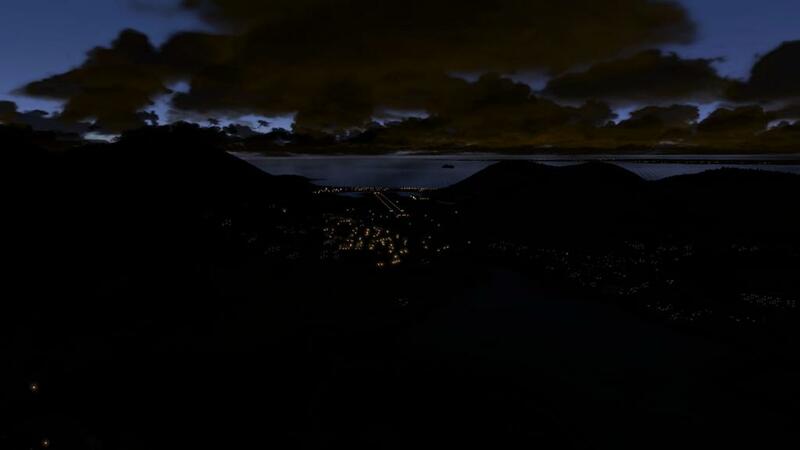 and move the camera viewpoint and the lighting disappears completely? So there is a basic issue here, or is it just too big a scenery for my computer to actually compute? if so then why does it work fine in the daylight? 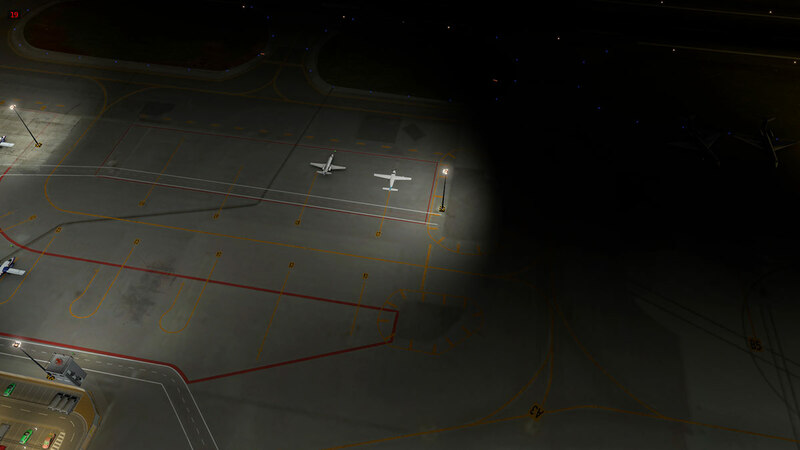 Lighting is however very good, especially around the Airport and Terminal area, but it is quite inconsistent everywhere else. 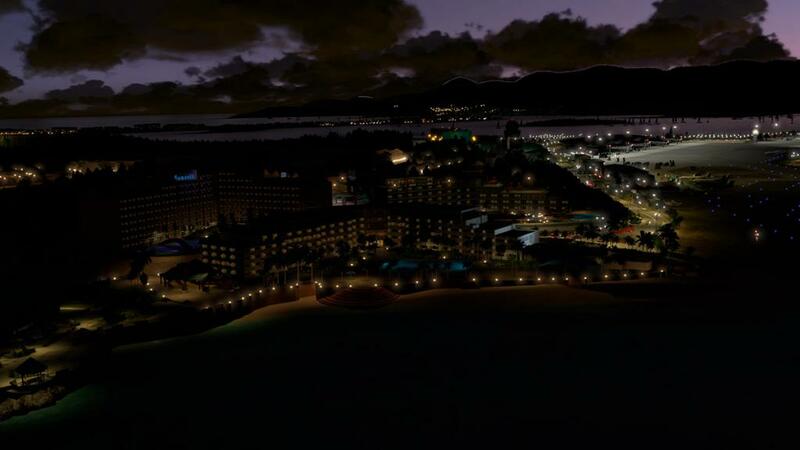 The highlight to the night scenery are the hotels on either side of the Maho Beach approach, as a lot of work has been done here and it shows, it is very good on the RWY 10 approach at night. 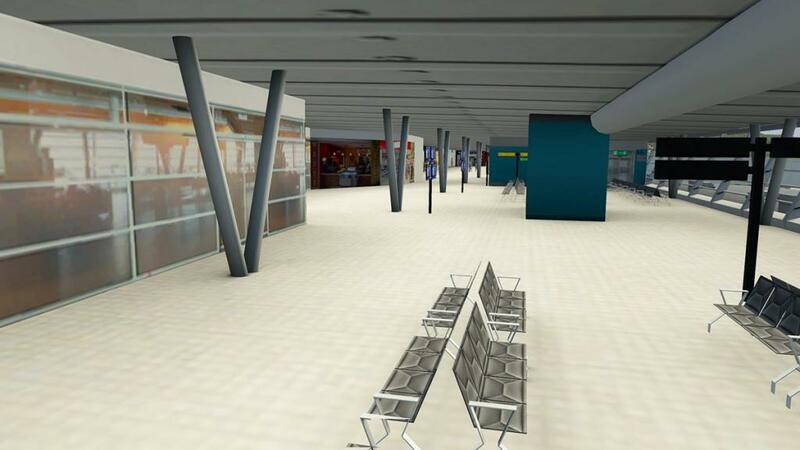 But move away from the TNCM airport and some areas are well lit, but other areas in the same context are not? so it is all a bit inconsistent. The harder point is that the lighting here at TFFG is quite small and even finding the non-lit taxiway from the runway to the ramp is a bit of an ordeal, it is arrowed here, but good luck in finding it. 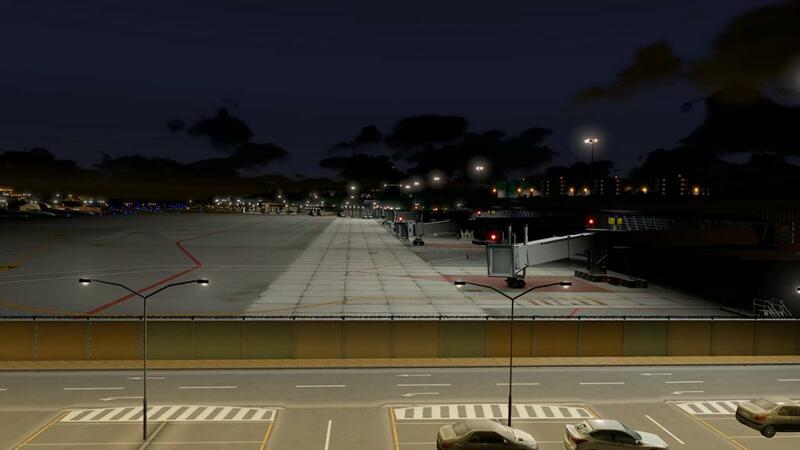 There are a few spots lit on the ramp and a nice lit carpark, but mostly this is not a place to fly in to or out of at night, the GA parking apron is very dark as well. Great iconic world airports are always welcome into any simulator, and the TNCM - Princess Juliana International Airport at Sint Maarten is right at the top of the list. There has been a few good, Sint Maarten sceneries for X-Plane, but this is the first real custom one created for the simulator on a larger scale. 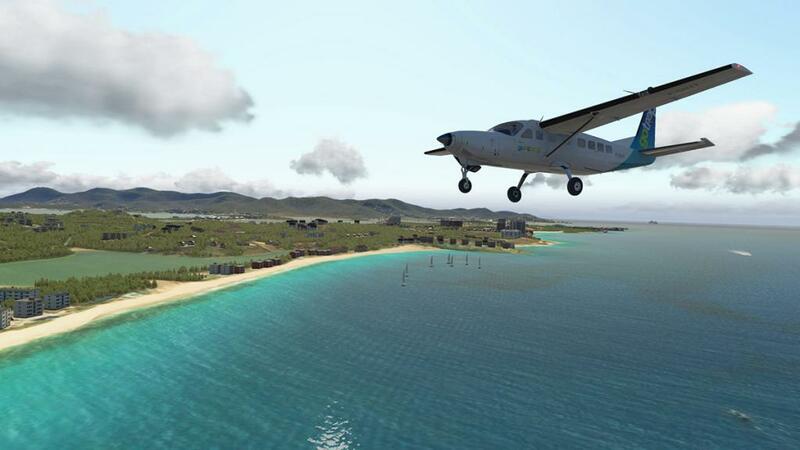 As scenery goes it is very good, and even nudging into the excellent category, as there has been a huge amount of work and certainly a lot of effort put in to pleasing the requirements of what we the X-Plane users would expect from such a iconic scenery. In that context it does deliver and deliver very well. My gut feeling is that scenery development of this size and scale is now really a team effort more than the single developer in wanting to deliver quality scenery, it overall feels a bit overwhelmed and consistency is brilliant in many areas but lacking in others. 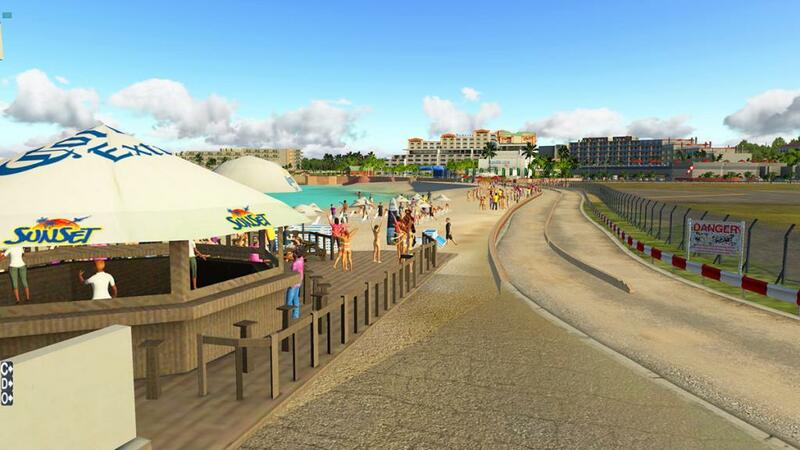 This is where team experience kicks in as one developer is excellent in some areas, then other team developers are good in other areas, as this is a first scenery release there is that factor to add in as well. What is missing here is that last bit of refinement, the standing back and crossing the t's and dotting the i's. 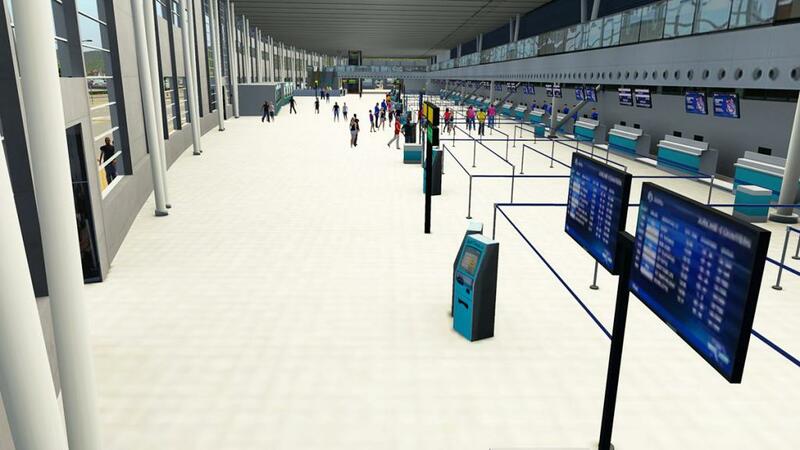 I have no doubt the developer will cover the small list of issues and quickly, but in reality I would have liked more of the AutoGate, GroundTraffic, ATC routes and certainly the traffic features working far above the lovely but really unimportant flashy features of say inside the terminal building, and the scenery needs a bit of editing here and there. 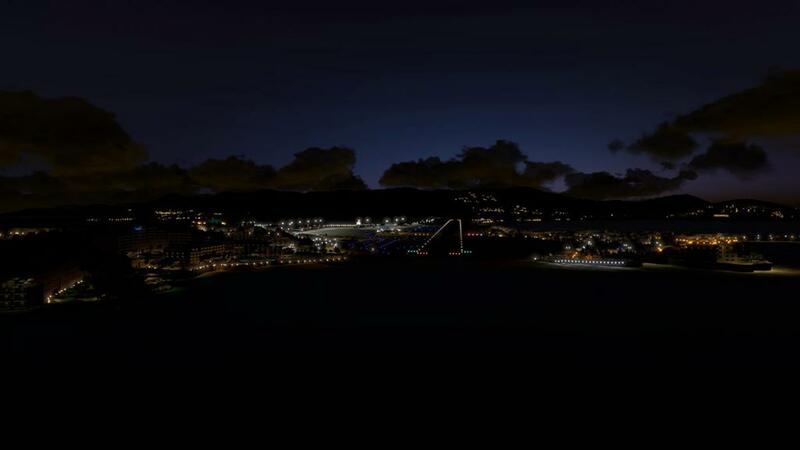 More of a worry is the sheer size of this scenery (13.5gb)? 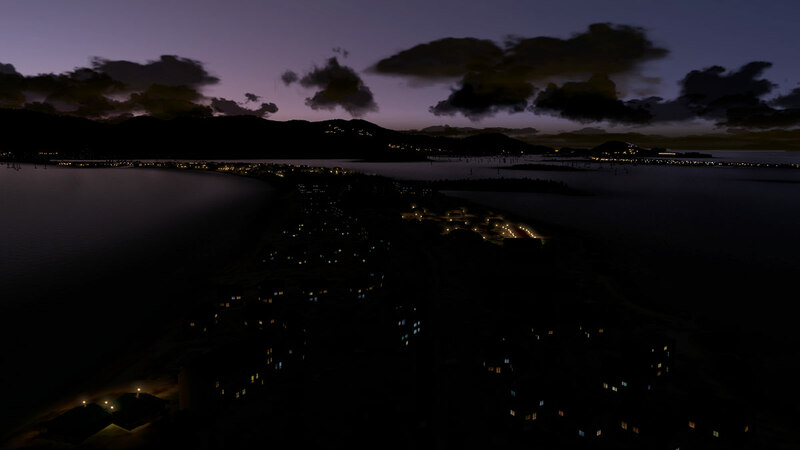 There seems to be a refinement missing to create efficient textures and ortho images, already the 4K textures have been downsized to 2K to counter that huge size, but the night images crushing of framerates seems to suggest that there is also something more required to make this scenery a more refined and efficient scenery for the simulator to absorb, this is also reflected on the computer requirements in order to run the scenery as well. 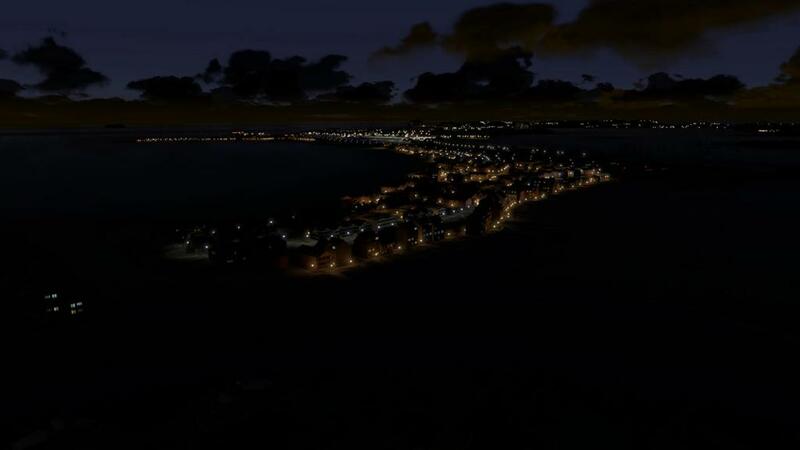 Remember the developer is going to add in even more to this already huge scenery size in part 2 of the package, I see my computer giving up at just the thought of that, and if I can't run that sort of size and requirements then certainly a huge base of users won't be able to either. 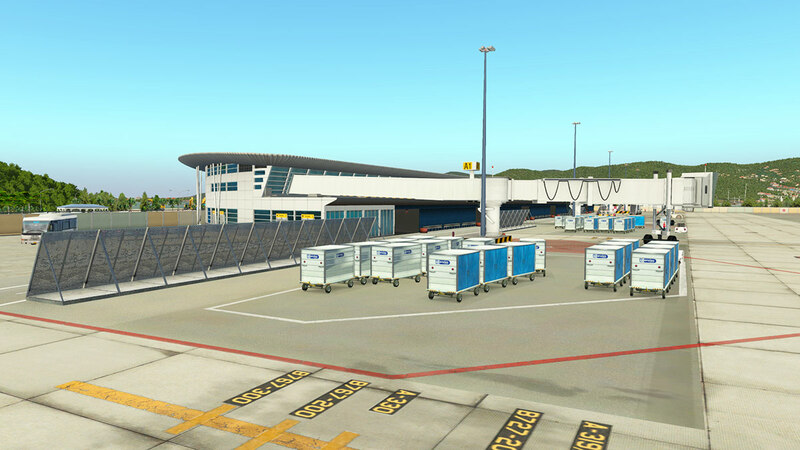 The size and scope of this scenery is simply huge, and with the just released FlyCorfu XP by FlyTampa you feel X-Plane is now moving into a new era of "mega" sceneries. 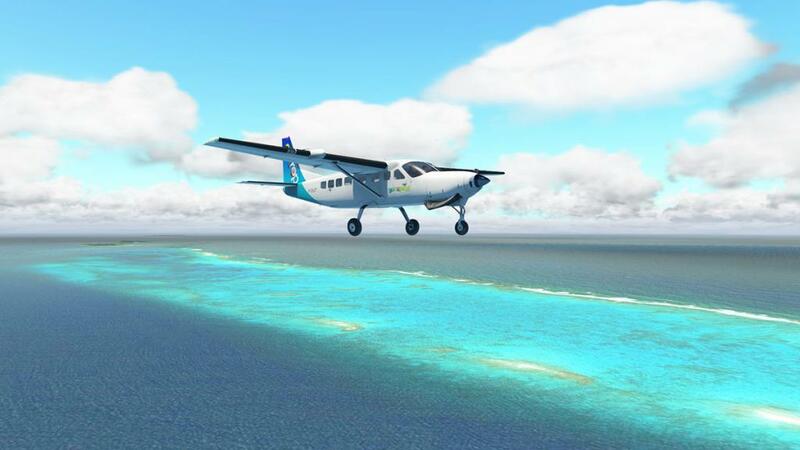 Overall this is very good scenery, and those excellent outer reef and shallow water conditions are flying heaven and there is plenty to explore here as well. And of course there is that iconic Maho Beach approach! 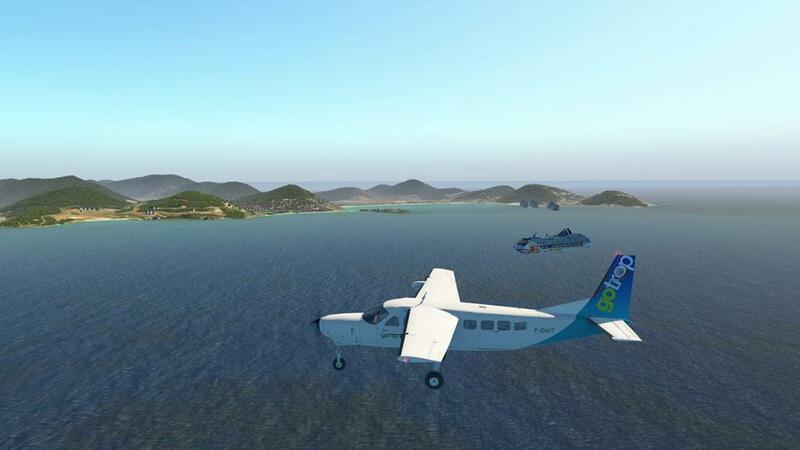 you so you will just have to recreate that iconic image won't you and fully test your flying skills to the limit, and it is well worth the effort when you do so. 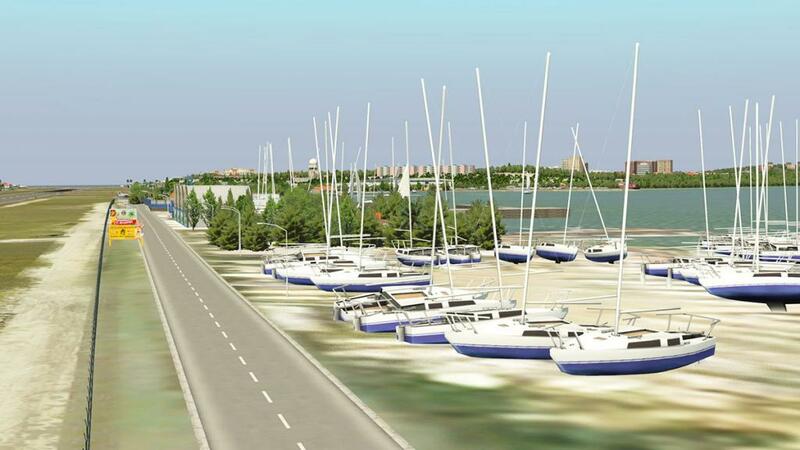 A minimum 16gb of RAM is required for efficient running of this scenery, and even then you are lineball. 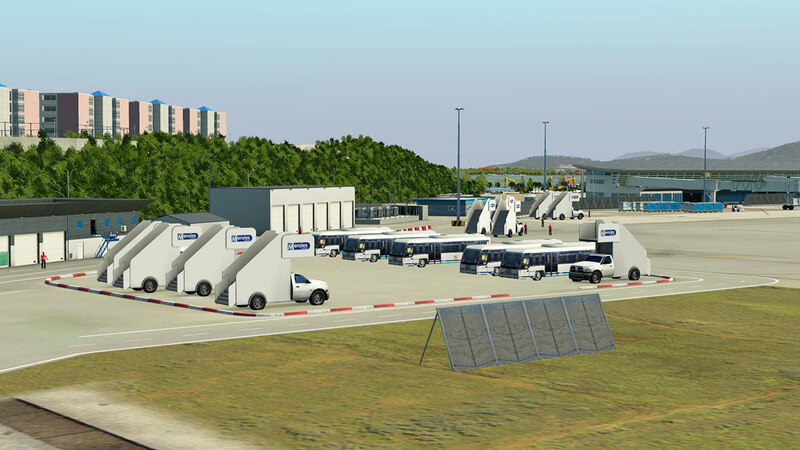 If you have installed in your custom folder TFFJ - Saint Barthélemy Airport by Nimbus Simulation Studios then be aware of the mesh conflicts between the two packages, the AWD sceneries need to be lower in your .ini list than the TFFJ Nimbus scenery or the AWD scenery will cancel out TFFJ? Otherwise they work very well together. 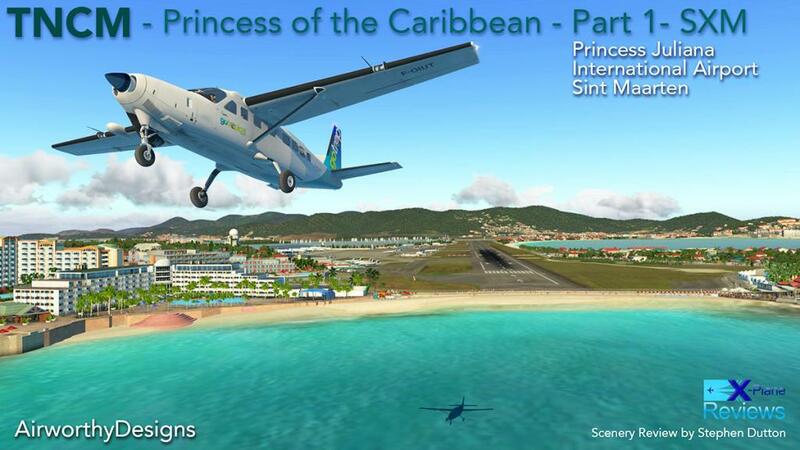 Purchased and downloaded AWDesigns-TNCM1 (TNCM - Princess of the Caribbean - Part 1- SXM). Followed installation instructions. In XP11, I set rendering options according to recommendations in the .pdf guide. 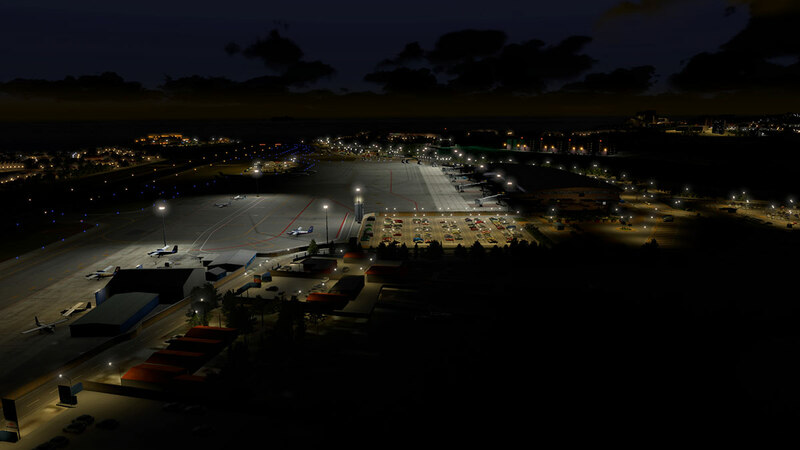 Reopened XP11 and reopened TNCM airport and only saw houses and roads. 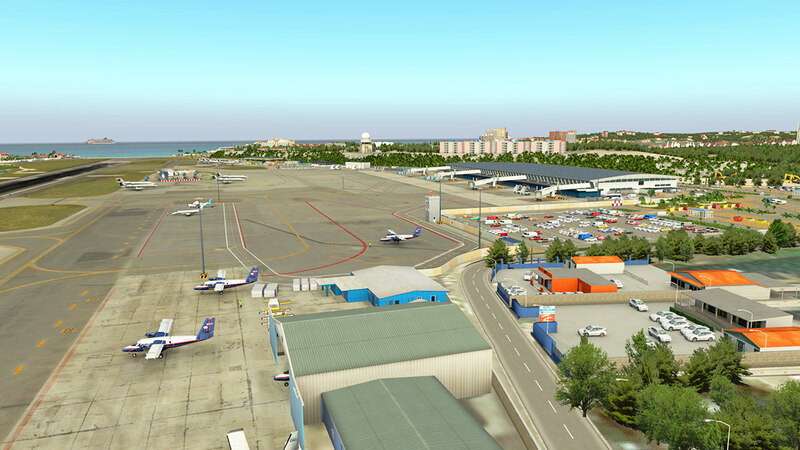 No airport, runway or other included scenery. Tried using both the 'Fast" and 'Pretty' options. In Customer Scenery folder, I renamed AWD TNCM - 2 - Apt to 'TNCM' and all worked ok.
"Runways follow terrain contours" is off? set on the general menu. This item was alway adjusted to "on"
Are you considering an update to report if the developer's several updates have addressed the issues satisfactorily? 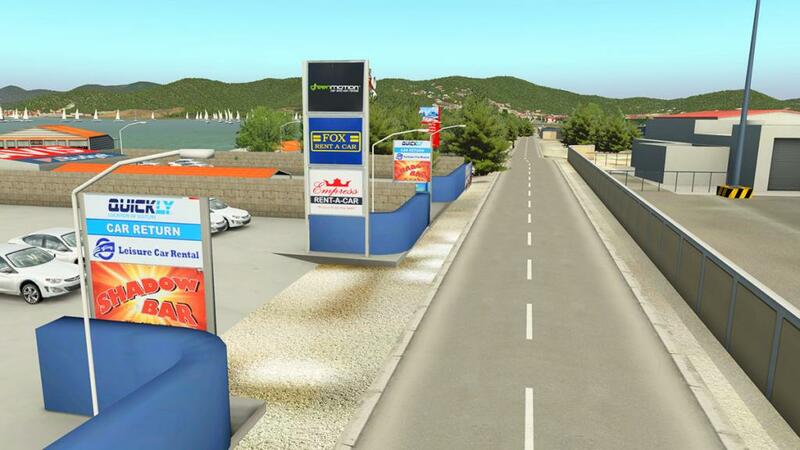 Thanks once again for another incredibly thorough review! Yes absolutely, but with the volume of releases we have to prioritise... I'll try to fit it in soon. I just purchased this product and in the zip file I do not see any install instructions / manual at all.....can someone please share the file, or let me know where I can get it? I looked at mine and see it's part 1 - perhaps instructions for both will come with part 2.